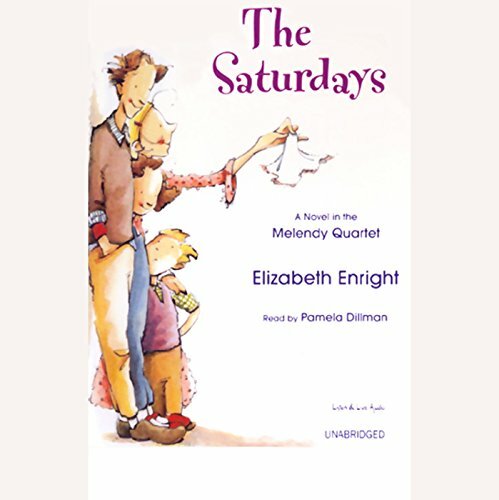 Written more than half a century ago, The Saturdays unfolds with all the ripe details of a specific place and period but remains a winning, timeless tale. ©1941 Elizabeth Enright Gillham, renewed 1969 Robert M. Gillham (P)2004 Listen & Live Audio, Inc.
My family and I loved this book. I have a 10 year old son and a six year old daughter. We listen to audiobooks in the car, and some of them make us want to keep driving--this was one of them. It captivated both of my children with the humorous adventures of the Melendy children. We will download the next one in the series immediately! Our whole family (kids 6 & 8) enjoyed this! It made travelling fun! (better than videos) Highly recommend - wish all the Melendy stories were available. I struggle to find audio books that will appeal to all 3 of my kids aged 4 to 11 . Somehow the adventures of the Melendy children fit the bill and they have entertained us through several long drives. The stories are timeless, and I love the positive view of family they present. Here is a family that respects differences, makes up after quarrels and remains tightly bonded. Try out this first one and you may be hooked! Kids listened to this during breakfast. A great way to start the day. Kids thought it was funny. I really enjoyed the narrator's many voices. I loved the story! It kept me exited all the time! The characters were crazy and funny. The best ever. totally perfect! my kids love all the books in this series. I wish there were more. This first book about the Melendy family is so fun! We found the rest of the series at the library, but this one wasn't available. We were thrilled to find it here at audible.com! This series is full of adventure for kids, and wholesome and very well written! Ms. Enright is a wordsmith, so listening is enjoyable, even for mom and dad! But my favorite thing about these books is that the Melendy children love each other. What a wonderful model for my own 4 kids, who imagine themselves right in the middle of the Melendy's adventures! It's hard to find books that demonstrate POSITIVE family relationships, so this one was a fabulous find! A much beloved childhood favorite! I had forgotten how much I loved these books as a kid. They sure do stand the test of time. My kids and I enjoyed the book. We used it for drive time and laughed.